OK, I've never been a big drugstore makeup buyer even though I would love to find what works for me there. One of the big reasons is that you can't test out the colors and it's too much of a bother to have to return it if it doesn't work out. And I'm willing to admit that the other reason is that I get suckered into the marketing schemes from department store makeup. It's just so much more fun to buy it from a line that makes you feel luxurious and pampered. In saying all that, I'm still willing to forgo the side benefits for a really good product and I reason that buying one particular product always from the drugstore frees up money to buy something else I want. For example I never buy expensive mascara anymore because drugstore is just as good. Right before Christmas I became obsessed with Nars and now I have loads of it to play with every day. I love it and I think I even dissed Mac eyeshadow in one of my last posts, but I am here to recant and give my devotion back to Mac! I'm a fickle sort anyway. You should know that. I just bought a couple of new colors of eyeshadow that are so beautiful which I will show you in a minute. Anyway, one of my Nars purchases was a set of lipglosses that I couldn't resist because I am a lipstickaholic and this was a set of 6! I tried them all and I was not impressed. They weren't long lasting and the colors weren't pigmented enough to cover my very rosy lips. I shamefully took them back to Nordstrom and apologized to Conrad, the sweet makeup artist from Nars Nordstrom. Sorry again Conrad! I know it must come off of his commission but $50 is still a lot for subpar lipgloss. All that being said, I am here to report to you a lovely drugstore lipgloss that is supreme in quality. If you have pigmented lips, I find the colors to cover them well, even the lighter colors. They are not sheer or watery. I suggest you buy them when CVS or Walgreens has them buy one get one free because, well because you can. Why pay more when you don't have to do so? It's Revlon Super Lustrous Lip Gloss shown here. My favorite colors are Foiled and Glossy Rose and I think the packaging is so chic. It reminds me of Chanel glossimers, but shorter. One thing that could be annoying is that they are always bringing new colors for collections and then they are discontinued. I don't want to fall in love with a color and then never be able to find it again. But like I said, I am so fickle that I hardly ever buy the same thing twice, even if I loved it. There is always something new to try! So ladies, let me know if you try this out and like it. Yesterday, I had some Nordstrom Notes to burn and I decided to visit Mac. I've been looking for a plummy eyeshadow that didn't give me an allergic reaction. There is something in purple eyeshadows that makes my eyes ooze and seals them shut at night. Not pretty! Mac's Cranberry and Sketch have already proven to me that I just can't use those type of colors so I stay away from those. But if I stay towards the more brownish red I seem to be ok. I've been waiting to try this color for awhile. You could say that I stalk them awhile before I buy them as I'm not a spontaneous buyer, much to the dismay of my very patient husband. I always leave the store with swatches all over my hands. The color I got is called Embark and is a matte formula. It's just what I was looking for and perfect with my hazel eyes. I also got Satin Taupe which I've wanted forever. Now that I have it at home, I see that it's very similar to Nars Kalahari, but that's ok because I love that one too. Another discovery I have and wanted to share has transformed my eye-makeup look. Usually I carefully put on my eyeshadow only to have it disappear later in the day. I've used several primers which worked ok, but I think this one is my favorite. They are called Paint Pots by Mac. Not only does the eyeshadow stick to them and make them stay, but they can intensify the colors you are using. I think the most popular for being neutral is called Painterly, but I also have Rubenesque which is a gold color, and Girl Friendly which is a rosy color. If you don't have much time to devote to makeup, they are great because you can use them on their own as a cream eyeshadow. I haven't noticed any creasing and they are super creamy to put on with your finger. These are a must-have if you are having trouble with your eyeshadows staying on. I bet they will even make drugstore eyeshadows look better. What's your favorite drugstore product? I'm always willing to try a recommended product and I bet a lot of others will be too with this economy. Leave me a comment and let me know if the drugstore item replaced a high-end product. I only have one drug store product and I LOVE it, Cover Girl Lash Blast. The best mascara ever. And, thanks for the tip. 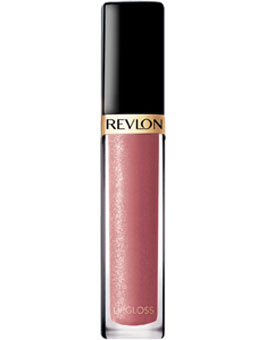 I am going to try the Revlon gloss. Max Factor's lip glosses are really nice and pigmented. I also adore Sally Hansen's Natural Beauty Inspired by Carmindy line. The textures and colors are superb. LBR-I like CG Lash Blast too and alternate it with Voluminous. Let me know if you like the gloss. Juicy-I'll have a look at MF and SH. I never glance at those lines, but I will now.